Is the Sunday Express being written by a bunch of Twitters? 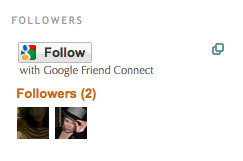 An account seemingly authored* by BBC TV critic David Stephenson (@pindarri), has only got 13 31 followers. 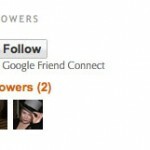 Other sites uncovered by Journalism.co.uk include his blog with its one inaugural post (December 26, 2009), which has earned him only 2 Google Friend Connect followers. 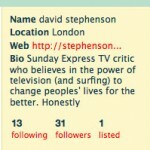 *We weren’t able to get through to David Stephenson yesterday afternoon, or this morning, to confirm that it’s his actual account, but it links to a blog set up in December 2009 and his TV related tweets date back further. 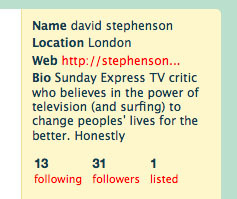 Journalisted only lists one David Stephenson at the Sunday Express. If it’s a hoax, we’ll happily wipe the egg off our faces. This entry was posted in Online Journalism, Social media and blogging and tagged david stephenson, Sunday Express on January 21, 2010 by Judith Townend.